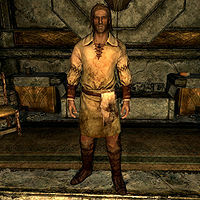 Tynan is a Breton witchblade who lives in Markarth. He works as a henchman and bodyguard for Nepos the Nose. He spends all of his time in Nepos's house, sweeping the floor and keeping up appearances, although he carries the same secret as his master and the other servants. He never eats or sleeps. Once Nepos reveals his scheme to you during the quest The Forsworn Conspiracy, Tynan becomes hostile and must be killed. He wears a set of barkeep clothes and a pair of shoes. He is equipped with an iron dagger, and carries a key to Nepos's house, as well as a selection of lower-class items and gold. Tynan's death can be avoided by pickpocketing and reading Thonar's or Nepos's journal instead of questioning them, then going directly to Eltrys. Alternatively, it can be avoided by going directly to Eltrys after questioning Thonar Silver-Blood. Tynan's name means "Dark One" in Celtic. This page was last modified on 12 December 2013, at 22:37.